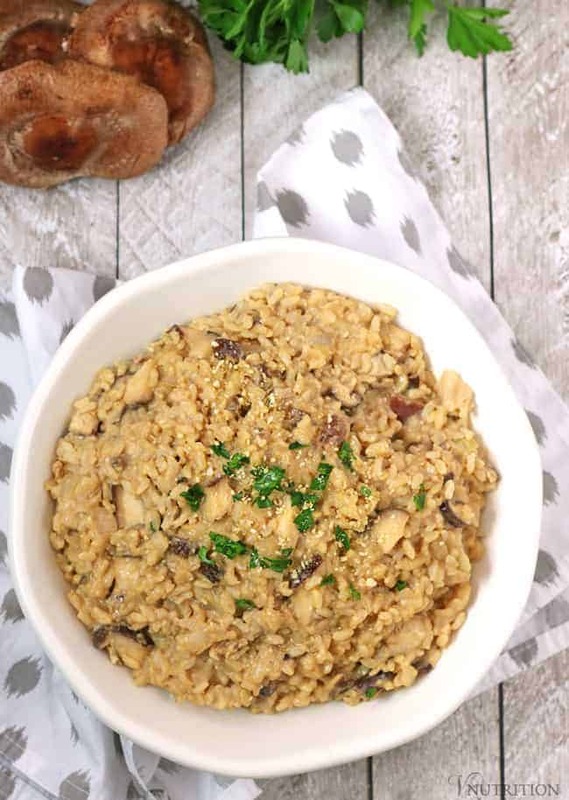 This Easy Vegan Mushroom Risotto saves so much time by using pre-cooked rice and creamy hummus. It’s an easy and healthy meal when you need dinner on the table fast. I’ll be honest with you, I’ve never been that into cooking. Are you now thinking “girl, then what are you doing with site sharing vegan recipes?”. Well, being a functional nutritionist, I realized the only way to stay healthy is to cook for myself most of the time. By cooking most of my own meals, I know exactly what’s going into them. Don’t get me wrong, if a fabulous chef decided she/he wanted to cook healthy and delicious vegan food for me daily, I’d be all over it but that’s not going to happen so I do it for myself. Lucky for me, I enjoy finding fun, healthier, and easier ways to create some of my old pre-vegan favorites (like my Cashew Mac & Cheese and Chipotle Queso). 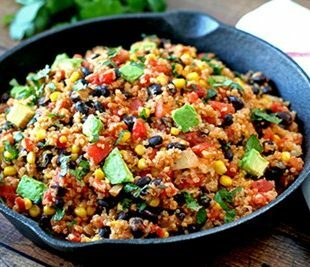 I also love sharing these recipes with others in case they’re looking for the same thing. 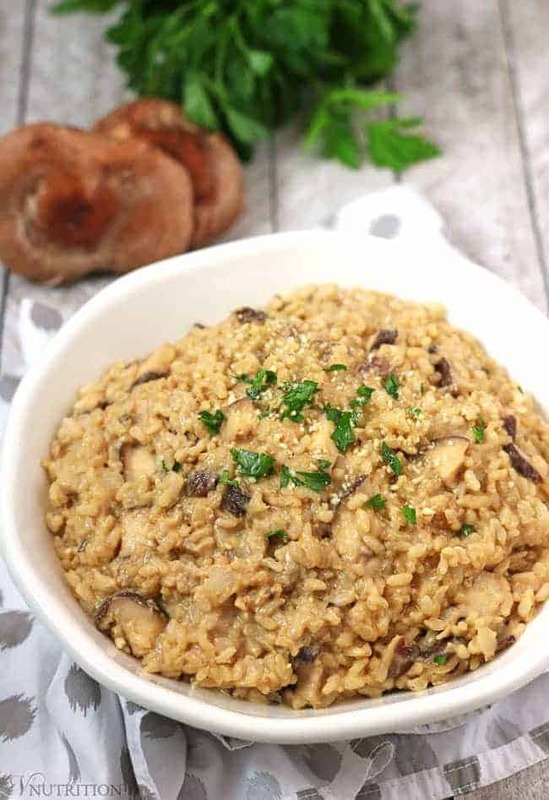 A 10 Minute Vegan Mushroom Risotto… Really? Yes… kind of. Okay maybe it’s not exactly a traditional risotto but my dish is creamy and tasty and I bet if you told people you cooked this risotto for an hour they would probably believe you. I usually don’t have an hour to keep an eye on risotto like you would traditionally do so I came up with a little hack to mimic the creaminess of risotto using hummus at the very end. I know! How awesome is hummus? 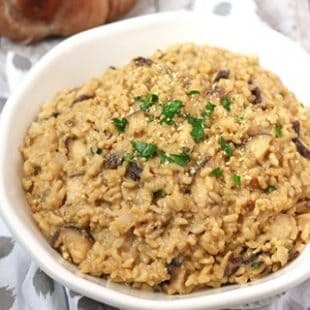 I’ve been doing this for years and realized I need to share this with you so you can have some tasty easy vegan mushroom risotto in no time as well. 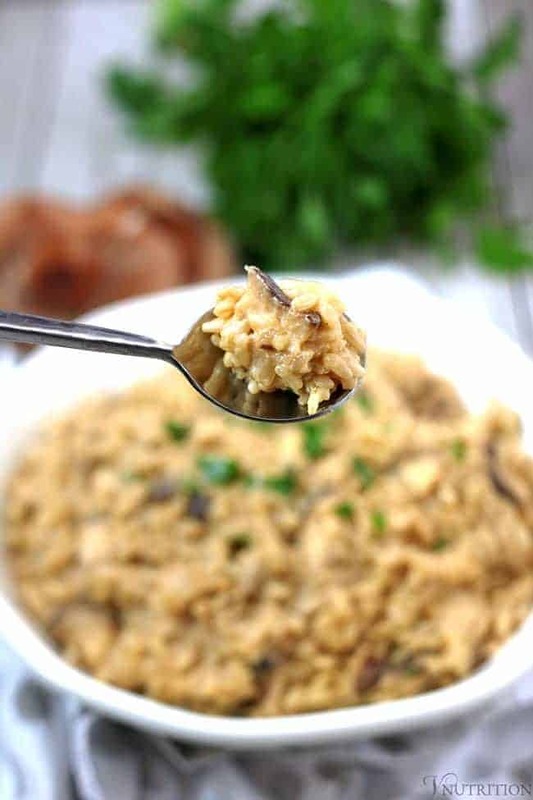 Meal Prep Tip: If you’ve read my Vegan Meal Planning post, you know I pre-cook the rice at the beginning of the week so all I have to do is cook up some onion and mushrooms, heat up the rice and add some hummus and I have a yummy and healthy meal on the table in 10 minutes! 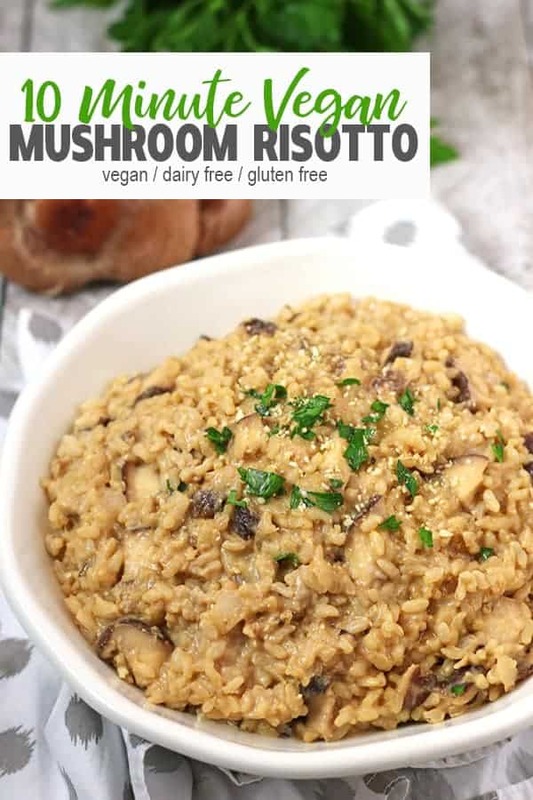 If you make this easy vegan mushroom recipe, let me know what you think by ★ star rating it and leaving a comment below. Heat oil in large saute pan/pot, add onion and garlic and cook 3 minutes until onion is translucent. If using veggie broth instead of oil, add enough broth to just cover the bottom of the pan and add more if needed. Add mushrooms and 1/4 cup of veggie broth and cook until mushrooms are done (about 5 minutes). Add another 1/4 cup of veggie broth, nutritional yeast, tamari, and lemon juice and stir. Add rice and cook for a few minutes until heated through. Turn off heat and stir in hummus. I just love risotto and it is always much easier than people make it out to be! Yes, risotto can be really easy! WAaaaaaa!!!!! Such a good idea!!! We have a running joke in our family about the Hubs wanting risotto and me thinking he’s crazy because he has no idea what goes into making it. I’ll have to give him this version! Thank you so much Julie! One day I was in the kitchen looking for a way to make my rice creamy and there was some hummus right in my face – been doing it since then – so easy! Long Time No See! Sorry about that! I’m also using my tea WP Account at the moment…sorry about that, too! But it’s Jennifer over at MyBlissfulJourney.com. Risotto – I need more of it in my life! This sounds and looks AWESOME!!!! Yes! I hope all is well with you Jennifer! Thank so much, I need more risotto in my life too! Mushrooms are by FAR my favorite food on the planet and risotto? In under 10 minutes? Count me in! 🙂 Thank you for sharing. I am definitely going to try this. Thanks so much Aimee! So many people in my family HATE mushrooms and I don’t get it. They are soooo good! I love how easy this is! I sometimes have leftover rice in the fridge, and I end up throwing it out, either because I forget about it, or I’m sick of making the same stir-fries. I’m going to try this next time! I love mushroom risotto, but I haven’t made it for ages and never in 10 minutes. I must try your recipe. Thanks! It’s easy using the pre-cooked rice and hummus. Let me know if you give it a try! I’ve never cooked risotto but your recipe has inspired me to. 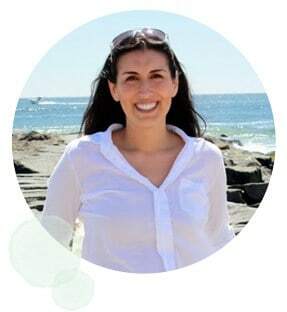 So happy to have found your blog Mary Ellen. Your recipes look delicious. Thanks so much Jill! Let me know if you give it a try! This looks great Mary Ellen! Wow, this is a great cheat! I love risotto! And I actually don’t mind making it…because usually I’m drinking all the wine that doesn’t make it into the dish. 🙂 But this is perfect for those nights when I want that creamy risotto taste and texture, but I don’t have time. Oh, I didn’t think about drinking the wine while cooking risotto – that changes everything! I have never tried making real risotto before, the adding of more broth for that long was so daunting to me but a little help from wine might not make it so bad! Thanks Jenn! I love making risotto, but sometimes time just isn’t on my side. Thanks for making a quick and easy recipe. Thanks Linda! Time usually isn’t on my side either. I love having some quick and easy meals in my back pocket! I’m saving this one to try on a busy night. What a quick and easy recipe and it’s perfect for using up leftover rice. I always cook too much! Loving your new logo too! This looks wonderful and much easier than I thought risotto would be. Can’t wait to try – thanks! Thank you so much Christine! I hope you like it! Wowzers! Mushroom-y goodness. This will definitely help cut down on food prep time, I love a quick meal. Especially with mushrooms!! I’m trying this out soon! So soon came around haha. Made this tonight for supper. And despite not having leftover rice, it still came together pretty quickly. I didn’t have plain hummus though! I almost panicked and then found some sundried tomato stashed at the back of the fridge and it saved the day. It was creamy and delicious. 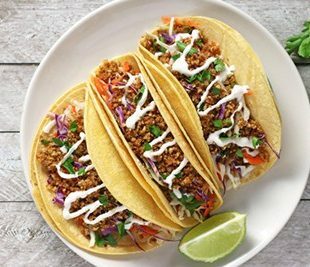 This will definitely become a staple in our meal rotation. What an awesome shortcut! Is there anything that hummus can’t do? Last night’s dinner. What a great recipe. I just want to say how much I love your tag line of “eat kind.” That’s what motivates and maintains my mostly-vegan diet (I have to be honest and admit I still eat some cheese). Thinking of how so many animals are raised in and die in torturous and grim conditions is so painful that it overcomes my desire to eat meat. Thank you for focusing on site on kindness. And, I am excited to try the risotto! Ann, thank you so much for your thoughtful comment. No one has told me they liked my tagline before so you made my day! 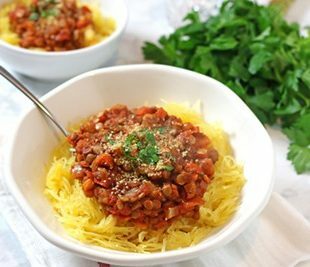 I’m a beginner cook, and never make vegan stuff– so when I saw this recipe, I was excited! It was a easy step into the vegan world! I made this and it tasted suuuuper good. I actually used spicy hummus because I like the taste. Thanks for a great dish! Hi Natasha! I’m so happy you enjoyed it! I love spicy stuff as well so I’ll be trying the spicy hummus next time – great idea!